Penitential days – The penitential days for the universal Church are each Friday of the whole year and the season of Lent. Lent begins on Ash Wednesday and concludes with the celebration of the Paschal Triduum. During this time the whole Church is invited to do penance in order to purify our hearts in preparation to celebrate the renewal of our baptismal promises on Easter Sunday. Abstinence – Catholics 14 years of age and older must abstain from eating meat on Ash Wednesday, Good Friday, and all the Fridays of Lent. It is only on other Fridays of the year, outside of Lent, that a Catholic may substitute another form of penance instead of abstinence. 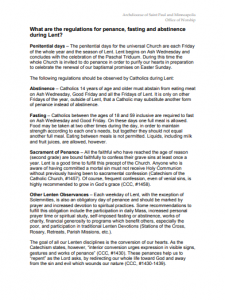 Fasting – Catholics between the age of 18 and 59 inclusive are required to fast on Ash Wednesday and Good Friday. On these days one full meal is allowed if necessary. Food may be taken at two other times, two smaller meals, in order to maintain strength according to each one’s needs, but together they should not equal another full meal. Eating between meals is not permitted. Liquids, including milk and fruit juices are allowed, however. Sacrament of Penance – All the faithful who have reached the age of reason (second grade) are bound faithfully to confess their grave sins at least once a year. Lent is a good time to fulfill this precept of the Church. Anyone who is aware of having committed a mortal sin must not receive Holy Communion without previously having been to sacramental confession (Catechism of the Catholic Church, #1457). Of course, frequent confession, even of venial sins, is highly recommended to grow in God’s grace (CCC, #1458). Other Lenten Observances – Each weekday of Lent, with the exception of Solemnities, is also an obligatory day of penance and should be marked by prayer and increased devotion to spiritual practices. Some recommendations include the participation in daily Mass, increased personal prayer time or spiritual study, self-imposed fasting or abstinence, works of charity, financial generosity to programs which benefit others, especially the poor, and participation in traditional Lenten Devotions (Stations of the Cross, Rosary, Retreats, Parish Missions, etc.). The goal of all our Lenten disciplines is the conversion of our hearts. As the Catechism states, however, “interior conversion urges expression in visible signs, gestures and works of penance” (CCC, #1430). These penances help us to “repent” as the Lord asks, by redirecting our whole life toward God and away from the sin and evil which wounds our nature (CCC, #1430-1439). 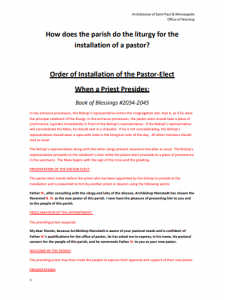 How does a parish prepare for the installation of a pastor? Find information on this in the Order of Installation of the Pastor. How does a parish prepare for the Archbishop or Bishop to celebrate Mass? Please fill out the following planning documents and return to the Archbishop’s Office by emailing Patrice Zangs. Completed Mass planning documents should be received by the Archbishop’s Office at least two weeks prior to the Mass date. What are the guidelines for communion services? The guidelines for communion services can be found in three documents: (1) the introduction to the ritual for Holy Communion outside of Mass “Eucharistiae Sacramentum” (1973), (2) a document entitled Sunday Celebrations in the Absence of a priest (this document may only be used on Sundays, but has principals which apply to other communion services), and (3) the recent instruction Redemptionis Sacramentum (2004). Here is what the documents basically say. A communion service is an exception granted by the bishop when people may not attend Holy Mass. They may be held regularly in places where the sick are and are not able to attend Holy Mass (hospitals and nursing homes). In these cases the ritual for Holy Communion outside of Mass is followed. If possible it is always better to gather the people together in the institution for the communion service, so that the communal nature of the Eucharist may be emphasized. In parish Churches the Bishop may also give permission for there to be a communion service, when no mass is available for the people. Generally in our Archdiocese this should not happen more than once a week. Again the ritual for Holy Communion outside of Mass is used, not the Sunday Celebrations in the Absence of a Priest. The very name shows that this ritual is only used on Sundays. Principles for such celebrations: If at all possible they should be run by a deacon. A deacon is still an ordinary minister of Holy Communion and this is always preferable to a non-ordained, extraordinary minister of Holy Communion. If no deacon is available a duly appointed extraordinary minister of Holy Communion may lead the communion service, see our Archdiocesan policy on the website for guidelines about appointing extraordinary ministers of Holy Communion. If this is the case the lay person, who may be a man or a woman, should be cautious not to “be seen as presiding over the celebration in the same way as a priest or deacon” presides (Sunday Celebrations in the Absence of a Priest, #28). This means they do not sit in the presider’s chair, and they should not give blessings and other things that presiders do. Where do we get low-gluten hosts approved for use at Mass? The Benedictine Sisters of Perpetual Adoration in Clyde, Missouri, have developed a true low-gluten host. The total gluten content of this product is 0.01%; its contents of unleavened wheat and water and free of additives conform to the requirements of the Code of Canon Law, canon 924.2. The low-gluten content is still enough gluten to confect bread for the Eucharist. Many gluten-intolerant persons may be able to consume it, or some portion of it, but are strongly advised to check with their personal physicians in advance. This product is the only true, low-gluten altar bread known to the Secretariat for Divine Worship and approved for use at Mass in the United States. What are the guidelines for the celebration of mixed marriages, i.e., the marriage of a Catholic and a non-Catholic? The directives for this are found the Ecumenical Directory published by the Vatican in 1993. What may a non-Catholic Christian Minister do at a mixed marriage celebration in a Catholic Church? A protestant minister may give “a blessing” to the couple, but this should not be the Nuptial Blessing, as this may only be done by a priest or, in his absence, a deacon. A blessing after the ceremony is recommended. He/She may read the scripture and give a reflection, and he/she may be seated in the sanctuary, but distinct from the priest/deacon who is presiding. He/she should NOT stand next to the priest during the speaking of the vows, so there is no confusion about who is receiving them. What may a Catholic Priest or Deacon do at a mixed marriage celebration in a non-Catholic Church? May we have the celebration of Holy Mass at a mixed marriage? Directory for the Application of Principles and Norms on Ecumenism, 159. Because of problems concerning Eucharistic sharing which may arise from the presence of non-Catholic witnesses and guests, a mixed marriage celebrated according to the Catholic form ordinarily takes place outside the Eucharistic liturgy. For a just cause, however, the diocesan Bishop may permit the celebration of the Eucharist (151). 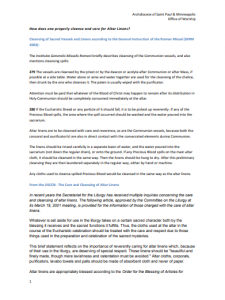 In the latter case, the decision as to whether the non-Catholic party of the marriage may be admitted to Eucharistic communion is to be made in keeping with the general norms existing in the matter both for Eastern Christians (152) and for other Christians,(153) taking into account the particular situation of the reception of the sacrament of Christian marriage by two baptized Christians. When can non-Catholics receive the sacraments? 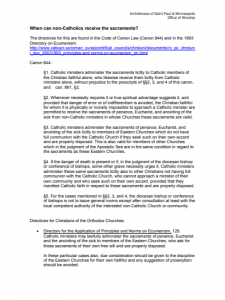 The directives for this are found in the Code of Canon Law (Canon 844) and in the 1993 Directory on Ecumenism. Find details in this document. How does one properly cleanse and care for Altar Linens? Please see instructions in the following document. Who is sick enough to receive the Sacrament of the Anointing of the Sick? In short, when judging whether a sickness warrants anointing, the Church’s documents encourage erring on the side of mercy, not severity. See especially canon 1005: “The sacrament is to be administered in case of doubt whether the sick person is dangerously ill.” And finally, recall that in exceptional cases even baptized non-Catholic Christians may be anointed, provided they meet the requirements in c. 844 §4.